Human rights groups at the United Nations and in Myanmar are hopeful the incoming government will radically change the country’s attitude to protecting human rights, after representatives for Nay Pyi Taw rejected a large number of proposed human rights reform made under the Universal Period Review process. The UN issued 281 recommendations by member states for improving Myanmar’s human rights record and practices. The recommendations are the result of the UPR process of the UN Human Rights Council, which took place on November 6. The recommendations cover a wide range of issues, from the signing of international treaties, to the establishment of full citizenship rights for Rohingya Muslims and the abolition of the “race and religion” laws approved by parliament earlier this year. 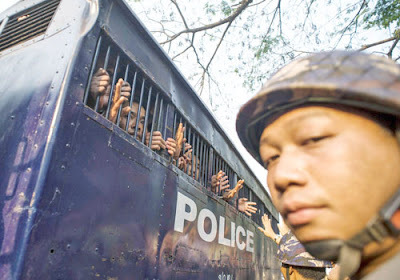 Several recommendations also urge Nay Pyi Taw to release political prisoners. Of the 281 recommendations, the government has decided to adopt 122, promised to examine 90 and rejected the remaining 69. On November 20 the UN will release a summary of the review. In that document, UN member states can voice their opinion on whether Myanmar has made progress toward the recommendations it promised to accept at the last review in 2011. Back then, Human Rights Council members put forward 190 recommendations, of which the government rejected 110. At first glance, the acceptance of the majority of recommendations this time seems to imply a greater willingness to address the issues raised than at the last review. However, human rights organisations argue that the government has decided to adopt only recommendations that are easy to implement, while dodging more complicated or pressing issues. “Most of the recommendations Myanmar accepted were ‘soft’ ones that fail to make specific, concrete calls for human rights change,” said Laura Haigh of Amnesty International. When it came to more concrete recommendations for action, the government only agreed to “consider” them, she added. That judgement was echoed by U Aung Myo Min, executive director of Equality Myanmar. He considers most of the recommendations accepted to be too general, lacking a concrete time frame. “One recommendation accepted is the continuation of the democratisation process. But that can go on forever without tangible indicators to monitor progress,” he said. U Aung Myo Min said he was disappointed at the government’s refusal to review and abolish repressive media laws, or legislation he considered discriminatory against women and religious minorities. “These laws should be abolished to ensure that media freedom and the fundamental rights of every citizen are protected without discrimination,” he said. Ms Haigh also noted that the government had outright rejected every recommendation containing the word “Rohingya”. “That is very disappointing – but unfortunately not surprising,” she said. Already in its national report, the government did not specifically address the suppression of the Rohingya or other ethnic minorities. It stated only that the constitution would guarantee religious freedom to every minority. That report, together with one by a group of UN bodies and another by human rights and civil society groups, formed the foundation of the review. In a meeting tentatively scheduled for the week of March 14 to March 18, Myanmar will report back to the Human Rights Council on whether it has decided to accept or reject the recommendations it took under consideration. According to UN spokesperson Cedric Sapey, Myanmar could also decide to implement recommendations it had originally rejected. This will not offer the new government a chance to make clear its position, however, as it will not take office until March 30, 2016. U Aung Myo Min said that the NLD should provide input to the government on the 88 pending recommendations, as well as who should be in the delegation for the next meeting. Civil society groups would encourage the NLD to do so, he added. Ms Haigh said that Amnesty International will call on the next government to reverse the country’s position on many of the issues when it takes power. The Myanmar delegation to the Geneva meeting of the Human Rights Council was led by Union Attorney General U Tun Shin.